If you have a question you'd like to add to the FAQ, please let us know at courseresources@uwindsor.ca! How does Course Resource Lists Connect to Blackboard? 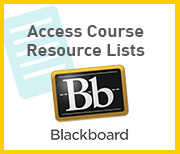 Faculty can connect Course Resource Lists to Blackboard by adding the Library Resource List Toollink to their course site. It's easy, just check out our Simple Steps Guide, watch a short video or get in touch with us at courseresources@uwindsor.ca. I've added the Tool Link in Blackboard, why can't I connect to my resource list? The connection between your BB course site and Course Resource Lists requires that the course codes match. So if your Blackboard Course is INDE4350-1-R-2019W, we need to make sure we use the same course code for your Course Resource List. So if you have a problem, please email us with your exact BB course code up - e.g. INDE4350-1-R-2019W. This can also be affected by the availability dates you set for your course. So if you set the start and end date for September 4th - December 22nd, the list will be visible during those dates. If you need to update this just let us know. In Blackboard, I've switched to student view and I can't access Course Resource Lists. Does this mean students can't access it? No. The student preview mode changes your user status to a preview user (e.g. djohnst_previewuser). Because this isn't a real user in the course or an instructor, it won't pass you to the reading list. Can I place my personal copies of textbooks, DVDs, CDs or other materials on reserve? Yes. If you have a personal copy of your item, you can drop it off at the information desk for us to place on reserve. It can be on loan for 2 hours, 1 day, 3 days or 7 days. We will then create a Course Resource List for you that you can share with students in Blackboard. What other types of items can I put on my Course Resource List? You can easily add online and print resources from the library. You can add almost any website including online videos, blogs, govenment sites, articles or other content. You can upload personal files you've created, or scanned materials the library has cleared for copyright. 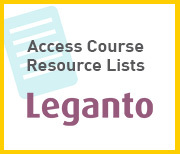 Where do students go to access their resource list? Students can login to their blackboard site and click the "Course Resource List" toollink their professor enabled for them to ensure access to all files and materials. However, they can also open Course Resource Lists directly as a guest to find resource lists for their class. However they won't be able to download any files as a guest. We return physical items to the collection or personal items back to faculty members. If your course isn't active your list will be kept but set to inactive until you would like to use it again for another course. It is easy to reuse your lists in the future. Can I export my reading list? Yes. You can export you list in a variety of files and citation formats. Just use the export option in your Course Resource List menu. Can I set viewing options and restrictions? Can you add materials that may need to be purchased? Yes. We will forward your request to your liaison librarian to see if they can purchase it. We can also check to see if an appropriate ebook is available for purchase for your class. Can the library digitize materials and help with copyright clearance? Please indicate the materials you need digital versions of when you submit your list. We will refer to campus fair dealing guidelines, pay for copyright clearance, or purchase an online resource (ebook) to meet the need if possible. Keep in mind that this takes time and that digitization/copyright requests should be submitted by the following deadlines. Can I still submit a word document with my list of resources? Yes. You can submit your list when you launch our service through Blackboard or via email to courseresources@uwindsor.ca. However, you will still need to add the Library Resource List toollink to your course site to ensure students have access to all materials. Does Course Resource Lists work best in a particular web browser? I tried to use the Cite it! widget but it didn't work. What am I doing wrong? You need to be logged in to Leganto on another tab for the Cite it! widget to work seamlessly and consistently. If you are not logged in to Leganto you will receive a log in prompt, however, some users may experience log in failure at this stage. If you are using a Mac having trouble with adding the Cite it! button to Google Chrome's bookmarks toolbar, right click on the CITE IT! button - > Copy link address and add this bookmark manually.